At my baby shower two weeks ago, we learned that Mike’s brother and his wife secretly bought our crib for us, yay! Last weekend, they dropped it off and this weekend we finally had a chance to put it all together. In case you forgot, we chose the Stratford crib by Baby Appleseed for it’s solid wood, formaldehyde-free construction. When I looked at the box, I was a little surprised to see this sticker on the outside. First I was a little taken back. I had specifically emailed Baby Appleseed to ask if the crib was a) solid wood and b) formaldehyde free. They assured me that both were true. At first glance, this sticker makes it seem as though there are some non-solid wood parts and that the crib does contain formaldehyde (though it meets California’s strict emissions standards). I emailed them again (they must hate me by now) and asked about the sticker. I was assured that what they told me was indeed true and that the sticker is required by law and put on all furniture pieces. Now I can sleep a little deeper at night and be sure that I’m not lying to my blog readers about my solid wood, formaldehyde-free crib. Anyway, back to the crib all assembled! 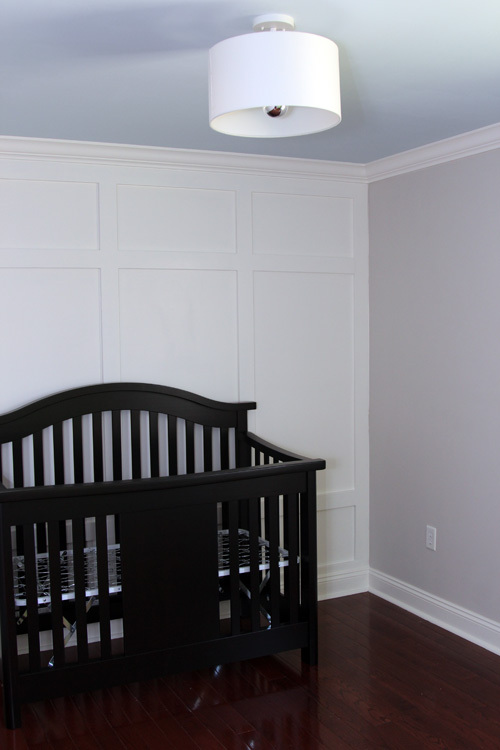 We love the way it looks against the paneled wall with the dark/white contrast going on. And with the blue ceiling. And the gray walls, which was a major concern when we were choosing a paint color. We’re so happy that everything is coming together the way we envisioned it. The crib will probably end up pushed to the left so that we can fit a glider on the same wall. If that glider ever goes back on sale at Babies R Us. I’ve been stalking it daily and it hasn’t been on sale since we first spotted it! Anyone know when big sales are at Babies R Us? Best coupon times? Anything?? It was $450 for both pieces when I first saw it and now it’s $600. Besides the glider, everything seems to be falling into place. I placed the bedding in the crib to see how it looked with the paint and everything and it looked great. I was nervous because it has brown in it, but the walls are grayish and I wanted to be able to mix the two neutrals well. Also, we bought a dresser this weekend and I’ll have to fill you in on that later this week. We are also debating our nursery light fixture since we found another one we like, but that discussion is still in the air. On top of all of that, we’re still in the midst of our mower and mulch search and we came to a bit of a sad realization regarding our family room carpet this weekend. Let me just say that life with a cat who is recovering from kidney cancer is not fun nor easy, though he’s doing unbelievably well. I’ll fill you in on all of that once we know a little bit more. In conclusion, things are not slowing down around here anytime soon! iT LOOKS great!! lOVE LOVE THE WALL !!! Love this room. The colors, sophistication, color on the ceiling, everything! When we have kids, this is exactly how I want the nursery to look. Well done. That crib is gorgeous! (I didn’t think I’d ever say anything like that, haha). It looks so well constructed and I love the arch on the back. Nice crib choice! I love the dark wood against the white! It’s so classy! 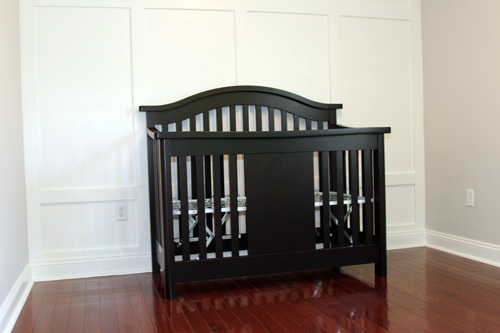 You should ask the crib manufacter if they consider MDF, plywood, and/or particle board solid wood. I have found many that claim these products are in fact solid wood, when clearly they are not. 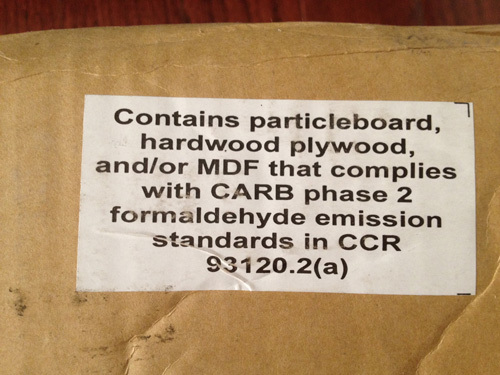 The comment that solid wood is formaldehyde free is incorrect as there is some formaldehyde in raw wood. So I don’t trust these people to start with. The correct statement is no added formaldehyde. That is interesting that anyone would consider those products to be solid wood, I don’t know how they think they could get away with that. And yes, you’re right that formaldehyde does occur even in natural substances, though the wording used in the email I received was “formaldehyde free”. I suppose we all just need to be informed consumers and not be afraid to question what we are buying! Now that you’ve had the Stratford crib for a year how is it holding up? Do you think it still meets your needs for being an affordable eco friendly option? I’m in the process of researching an eco friend/green crib and came upon this brand and love the look. It seems many other companies that advertise and are sold as green include MDF (Oeuf, Spot on Square, Bloom etc.) and are more expensive. 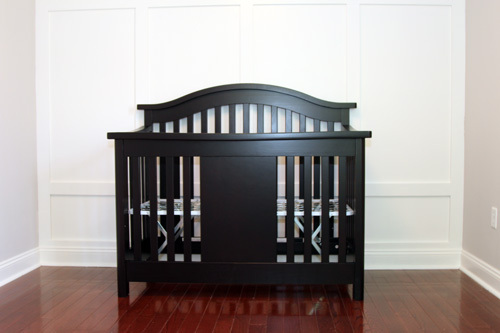 Also, in terms of solid wood cribs, the Stratford seems a lot cheaper then other options. Hi Kari! Yes, the crib still meets our needs! My son is 21 months now and still sleeps in it and my only complaint is that some of the finish on the top is worn ever so slightly where I lean over the crib (I think my button on my jeans rubs it). We also have a few chew marks, but it’s my own fault for not buying a guard for the top. Both are rather minimal and can’t be seen from a distance. Correction – for *over* a year. I’m not sure when you purchased it vs. when it was first used but since this post is almost 2 years old I am assuming you’ve been using it for over a year at least.